One of CLAMP's most bizzare stories. A retired soldier stands in the presence of an elderly lady. She brings up past events and twists the truth so the man will cave in to her demands. He has no option but to agree to deliver a package. He only lost his hand last time, what else does he have to lose? This is just another General Ko job for former Secret Operations Deputy Commander Kazuhiko Fay Ryu. CLOVER is a story that can throw the reader for a loop if they don't pay close attention. Characters and names are tossed into the mix and form a gigantic web of deceit in which nothing is as it seems. And through it all Kazuhiko must protect the Clover named Sue, a girl with many bizarre special gifts, at all costs while keeping himself alive. What I found most distressing about reading the serialized version of the series in SMILE was that it was nearly impossible to figure out what the heck was going on from issue to issue. This is not a series you can just pick up and hope to understand what has gone before. The series starts out with Kazuhiko being forced out of retirement and given some strange mission. He finds a girl with wings in a green house and then ends up having to escape from the Azuiean Army and the government known as Parliament who want nothing but to harness the girls powers. But, when you throw in the fact that all of this is just implied by the story through conversations and constant scene changes, which by the way are all given simple titles, it makes the story take on a real sense of mystery where it's up to the reader to interpret what's going on. This is really a story that is meant to be read in tankoubon form and TOKYOPOP's presentation of the story in this case is what really makes the series come alive. The translation is easy to follow and doesn't have a lot of needless words thrown in, which helps to add to the effect of Ora's song that Sue sings throughout the story at various points. Plus, the book is the same size as the Magic Knight Rayearth books which, if you don't know, are the size of the trade paper backs that VIZ puts out. The main gripe I have with CLOVER is that it reads as fast as their gothic doomsday story X due to the pacing and sparse use of text. I'm not the fastest of readers, but it's kind of a let-down to know I raced through a 124 page book in less than half an hour. For the curious, I timed myself for the heck of it and learned I finished the book in 22 minutes and 16 seconds. That's about the time it takes me to read a text-heavy issue of JLA. In many ways, CLOVER can be compared to X because of how little text actually appears in the book. However, in stark contrast, the artwork's backgrounds are no where near as detailed as those seen in X. The backgrounds are all but non-existent due to the unique nature of the works panel scheme that acts like a wall filled with portraits. In some cases, the page is filled with totally black panels with a word balloon inside or maybe some text from the song that is repeated throughout the story. In other instances, panels feature head-shots of characters and in others there are dramatically detailed action scenes portrayed in lenticular freeze framed sections. The characters in the story are the only things that make this work recognizably CLAMP's style. The main characters seem to be based loosely on the attire of the Autozam battleship pilots from Magic Knight Rayearth. 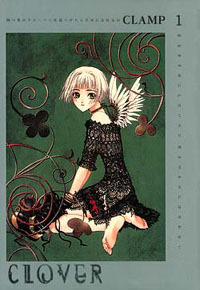 If you manage to figure out the complex plot of the CLOVER series, the next thing to focus on is the thing that makes all CLAMP works fun - trying to figure out just where the inspiration for the characters come from... and how they relate to the other stories.